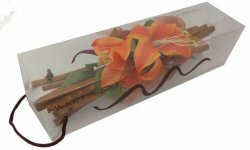 300mm cinnamon quills bundled, beautifully scented and handtied with ribbon. Decorated in a variety of styles from old fashion roses to glittering butterflies. Now packaged in a stylish presentation giftbox. New designs regularly displayed here. DISCOUNT FOR 12 OR MORE.